A.k.a. Alexander Street Video. Includes American History In Video, Counseling and Therapy In Video, and Ethnographic Video Online. Alexander Street Video, a.k.a. Academic Video Online, which includes American History In Video, Counseling & Therapy In Video, and Ethnographic Video Online, is a database of documentaries, educational videos and news footage. It does not contain movies. Go to library's home page at www.esc.edu/library. 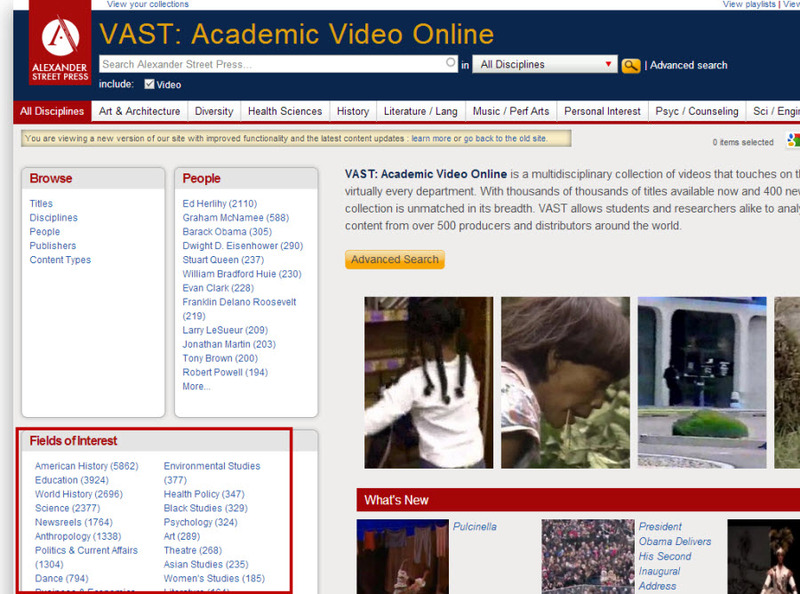 Click Academic Video Online, which is the second in the list. Enter your college login and password. You will also find Alexander Street Video and its sub-collections in many of the library's Subject Guides, available through the Resources By Subject link on the library home page. 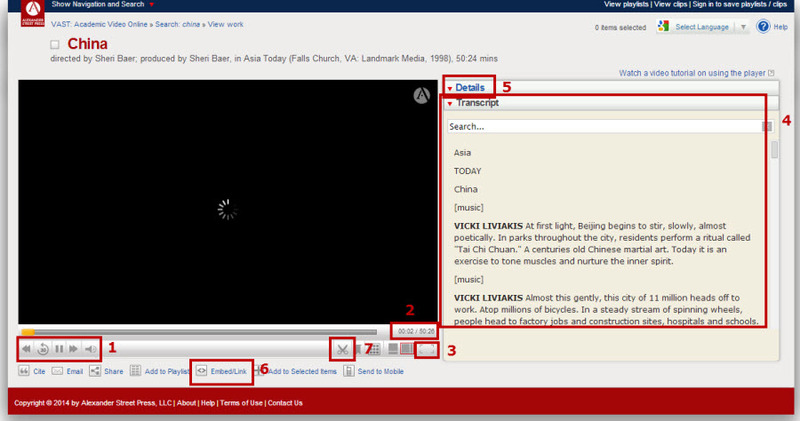 If you know the title of the film or film segment that you are searching for, Basic Search is your best option. Just put the title in quotation marks in the search box and click Search. If you want to search for a film but you don't know its exact title, or you want to find a film on a particular topic, try Advanced Search. To get to Advanced Search, click the Advanced Search link in the blue bar going across the top, to the right of the Basic Search box. Enter your keywords into the Words Anywhere box. Or you have multiple other search options, including searching by author, performer, full-text of a transcript, place published, place recorded, date published, date recorded, etc. Another way to find a video to browse by topic. 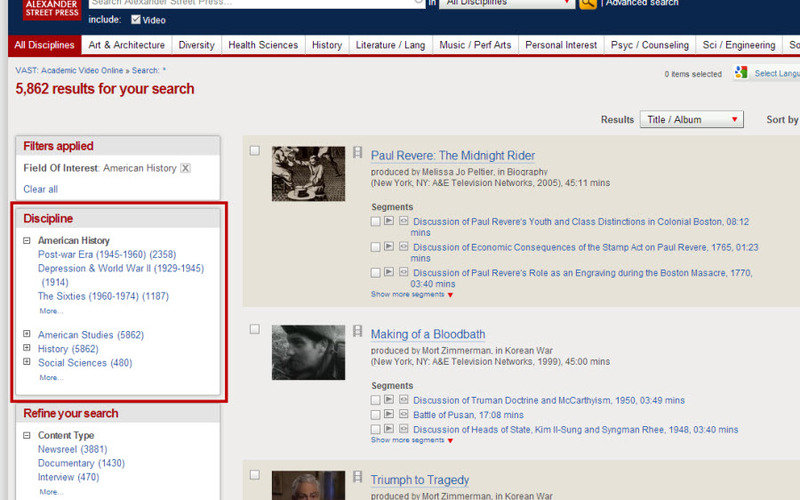 Go to the Fields of Interest menu on the lower left side of the page and select a topic. 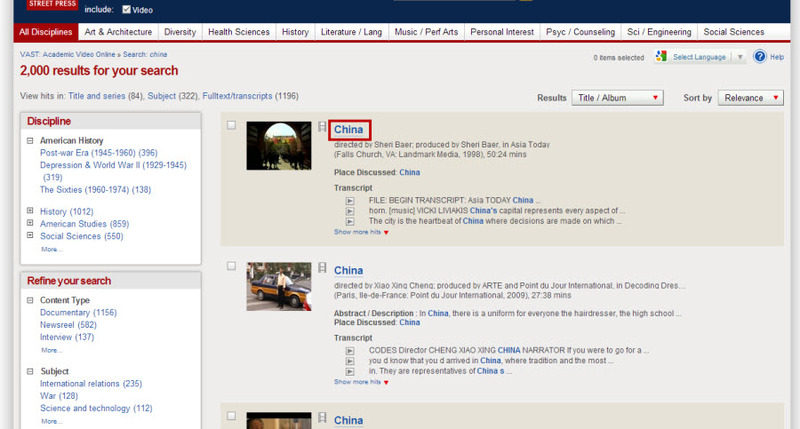 Once you have selected a topic, you will be taken to all the videos on that topic (listed on the right side.) On the left side, you can narrow your search by clicking on one of the sub-topics listed under Discipline. You can click the More... link to see a full list of sub-topics under a topic. When you do that, the Select Topics dialog box pops up. Click the Include checkbox next to any sub-topics you want, and then click the yellow Update button to see videos in that sub-topic. 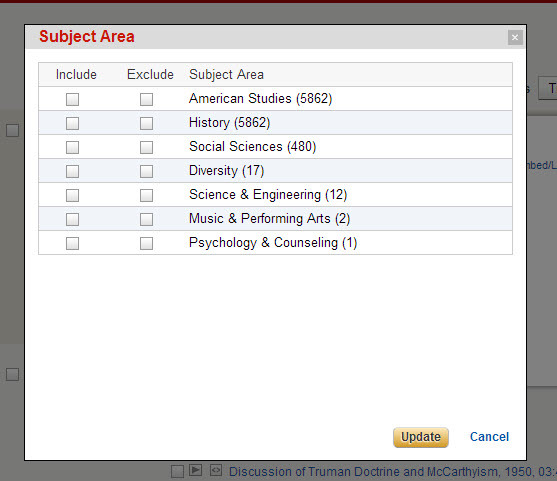 Or you can click the Exclude checkbox to see all sub-topics except the one you selected. Whether you Searched or Browsed, your results list will look the same. Use the numbers at the bottom of the results list to go through the pages of your search results. Click on the title of a video to go to its video information page. Use the controls at the bottom left of the video to start, pause, or rewind the video and to adjust the volume. At the bottom right of the video, the total duration of the video is displayed, and the time elapsed. Below that is the control to make the video full-screen. To the right of the space where the video plays is the video's transcript. To see full details of the video such as the production company and copyright information, click Details to the right of the video. The Embed/Link icon beneath the video gives you the permalink to the video. Use this if you want to save a link so you can come back to it later, or share it with someone else. The scissors icon beneath the video is for making Clips. For more information about making clips, go to the Your Alexander Street Video Account tab at the top of this page.